Manila, September 2016 – With over 150 guests from various industries and organizations including the Philippine Center for Print Excellence Foundation, Packaging Institute of the Philippines and Philippine Plastic Industry Association, Epson Philippines has recently reached out to its regional customers through the Davao leg of Print & Label 2016. Last 9 September to 11 September, business owners and technology enthusiasts were able to gain a one-of-a-kind experience on how the latest innovations in printing can help businesses excel further with Epson’s durable products and technologies. Held in the SMX Convention Center in Lanang, Davao City, existing partners and potential users came by the Epson booth to see state-of-the-art printing applications up close that were used with Epson’s high-performance printers. 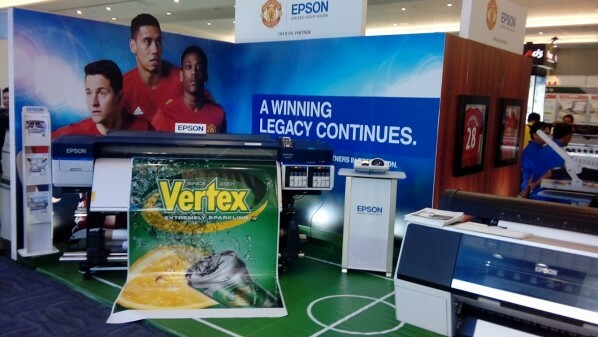 For Print & Label Davao 2016, Epson made use of football-inspired booth elements that were produced using Epson printers. These elements include a mini football field and a stadium background which made the Epson booth stand out during the event. To maximize the football-inspired booth, the Commercial and Industrial Printers team organized an engaging product presentation and demo session for event attendees to witness Epson’s latest printers. Among the products that were showcased are the SureColorTM S-Series printers, Epson’s latest high-performance roll-to-roll eco-solvent signage printers with new technological advancements. This line’s features include the high-performance PrecisionCoreTM TFP printhead that produces output quality at high speed, a new Print Mode that improves image quality by reducing visible banding, and an auto media adjustment system for significantly faster speeds. Among the SureColorTM S-Series line is the Epson SureColor SC-S60670. The SC-S60670 incorporates the latest Epson printing technologies that allow high-volume printing with minimal downtime. The Epson SureColorTM SC-F6270 was also highlighted at the Print & Label Davao 2016 and proved to be a crowd favourite among textile business owners. The SureColorTM SC-F6270 is designed for sheet production, ideal for short-volume dye-sublimation transfer printing of custom clothing, soft signage, merchandise and even hard surface work. And lastly, photographers who want to make an income out of their prints were interested with the SureLab SL-D700. The SL-D700 can print high-quality photos of up to one metre in length. Also, the SL-D700 is Epson’s first 6-colour compact photo production printer with inkjet technology. It utilises Epson’s Micro Piezo printhead and image processing technology which all make for the vivid quality on photos, cards, art reproductions and other quality print products. As part of the event, Epson also presented the SureColor-P7000 Large Format Printer’s state-of-the-art features and its advanced colour printing technologies through a live demo session. Along with its advanced features and capabilities, the SureColor-P7000 is also equipped with industry-leading software solutions which make it the perfect business equipment for large format output. Lastly, to further showcase the technologies in printing applications, the SureColor™ SC-P407 was commended by event attendees that are currently in the professional photo printing industry. Its professional-quality output can be attributed to the SureColor™ SC-P407’s advanced pigment ink set, the UltraChrome™ Hi-Gloss 2 that delivers an ultra-wide range of colours. “We are truly honoured to elevate printing by bringing the latest technologies and innovations to our dear customers here in Davao City through Print & Label 2016,” shared Pamela Albar, head of Epson Philippines Corporation’s Commercial & Industrial Printers business. “Epson Philippines is continuously seeking avenues where we can further strengthen our relationships with industry leaders who continue to make Epson their partner in advancing their businesses”, she added. The Print & Label Davao 2016 is a major event where companies showcased advanced equipment, technologies, and services that trade buyers and industry leaders can use for their business. ASUS PHILIPPINES JOINS SHOPEE 9.9 SUPER SHOPPING DAY!